After a decent upward move above USD 4,000, bitcoin price started a downside correction. BTC/USD declined below USD 4,000 and USD 3,980 supports levels. The price is currently (UTC 08:30 AM) consolidating above USD 3,900 and USD 3,920 support and it could soon resume uptrend. Similarly, ethereum declined below the USD 150 support and it may correct further towards the USD 140 support. Ripple price struggled to hold gains above the USD 0.370 support and later corrected below the USD 0.362 and USD 0.360 supports. The current price action is slightly bearish, but dips in bitcoin and altcoins remain supported. There is no successful close above the USD 4,000 level in bitcoin price . BTC/USD started a downside correction below USD 4,000 and declined below the USD 3,980 support. The price tested the USD 3,925 support and it is currently consolidating losses. To bounce back, the price must break the USD 3,980 and USD 4,000 resistance levels. On the downside, an initial support is at USD 3,925, below which the price may decline further towards the USD 3,900 or USD 3,875 support level. Ethereum price started a downside correction below the USD 155 support. ETH/USD is down more than 4% and it is currently trading near the USD 146 support. If the price declines further, it could test the USD 142 and USD 140 support levels. On the upside, an initial resistance is at USD 150 (the previous support), above which the price may move back in a positive zone towards USD 160. Bitcoin cash price declined recently below the USD 160 support. 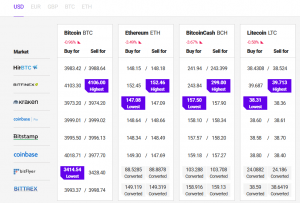 BCH/USD is down more than 4% and it may continue to move down towards the USD 152 and USD 150 support levels. On the upside, the main resistance is at USD 160, above which it could test USD 165. EOS declined below the USD 2.75 support recently. It must stay above the USD 2.60 support to start a decent recovery. Resistances are seen at USD 2.75 and USD 2.82. Ripple price failed to stay above the USD 0.370 support and declined below USD 0.365. The next major support is at USD 0.350, which could produce a short term bounce in XRP. During the past few hours, a few small cap altcoins declined more than 10%, including DEX, ELA, WAVES, WTC and LINK. Out of these, DEX dived more than 16% and ELA is down close to 12%. Meanwhile, Ethereum Classic is down by 7% after it has suffered a serious attack on its network. Overall, bitcoin price is currently consolidating above the USD 3,900 support. As long as BTC/USD is above USD 3,900 and USD 3,850, it could bounce back and move past USD 4,000. If not, there is a risk of a downside move in bitcoin and altcoins in the coming days.